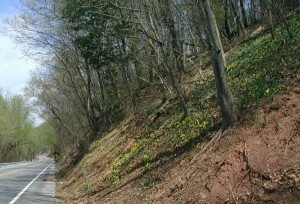 The weather has been unusually warm for much of the US East Coast for the past week. 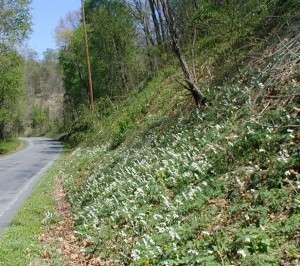 The heat continued to rise to 25 degrees or more over the average for this time of the year, which is about 58 degrees. 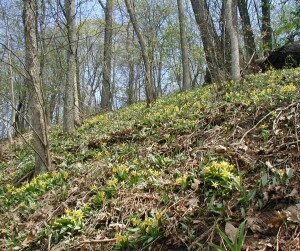 In Millerstown, PA high temperature records of 85, 89 and 89 degrees were set on April 5, 6 and 7. Yesterday, we tied the record at 86 degrees. 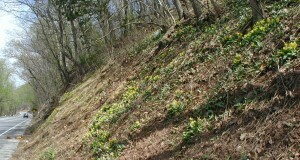 Then the cold front came through. 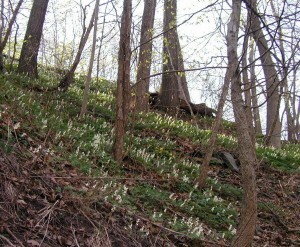 It was a fast storm that reset the temperatures down to normal. 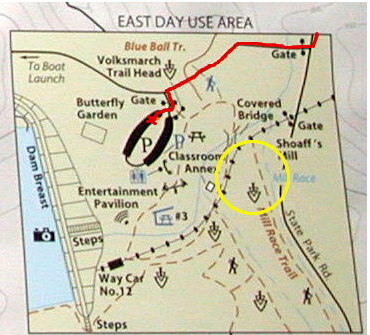 Winds blew gusty, lightning hit all around us, the power flicked on and off a few times, and finally a soft rain cooled everything off. 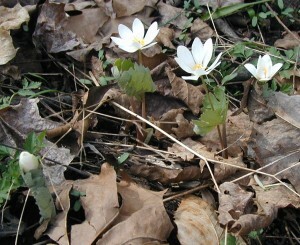 The sunny and warmer than usual weather has pushed vegetation growth and flower blooming much faster than normal. 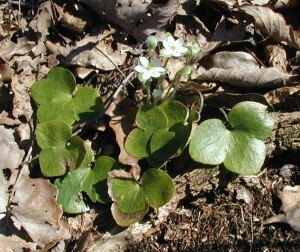 Plants grow and flower according to the amount of sunlight received and temperatures experienced. 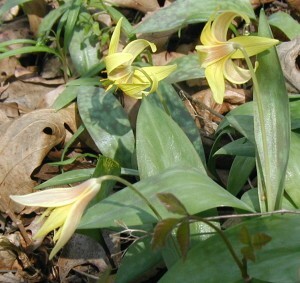 So, it is a combination of warmth and light that will indicate to a plant that the time is right for flowering, or fruiting for that matter. 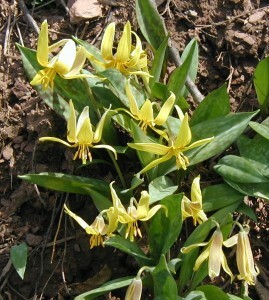 Higher temperatures will speed up plant growth and as a result the time of flowering can arrive sooner. 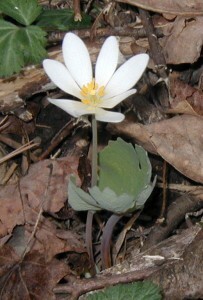 The opposite may happen during colder than normal temperatures where growth is slowed and blooming delayed. 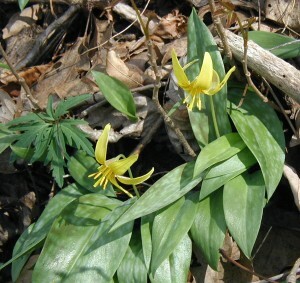 Additionally, some plants are not sensitive to the amount of light available, so sunlight is not a factor in their blooming time. 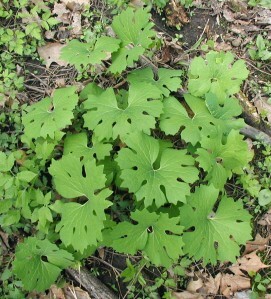 These plants are called photoperiod-insensitive plants. 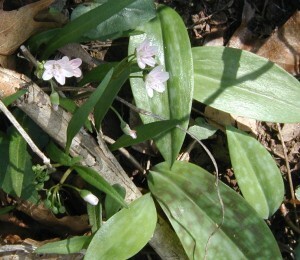 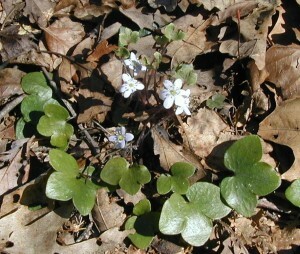 A woodland plant blooming earlier in 2010 is Hepatica. 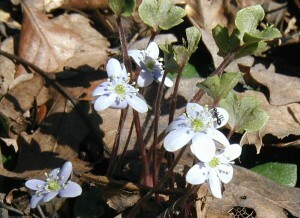 We know that hepatica, one of my favorite woodland plants, blooms in very early Spring, before the trees leaf out. 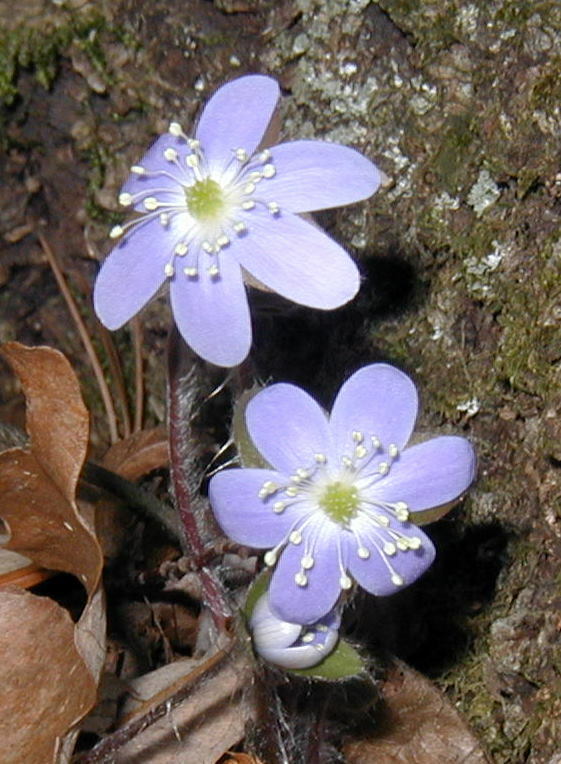 That means that hepatica will bloom in Pennsylvania sometime in April, depending also on latitude and elevation. 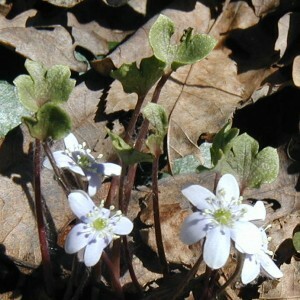 Will weather conditions, which are very quick to change this time of year, dictate the blooming times of hepatica? It seems so, considering that in 2010, with record-breaking high temperatures, we have observed hepatica and other plants blooming much earlier. 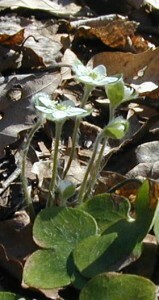 Prior articles on wildeherb.com contain some photos that illustrate the early blooming. 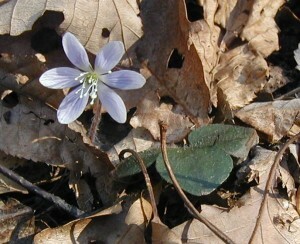 In 2007 hepatica was photographed blooming on 21 April. 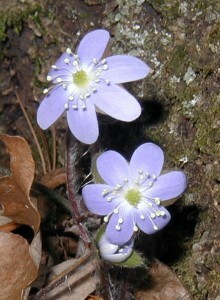 In 2006 hepatica blooms were photographed on the 11th and the 19th of April. 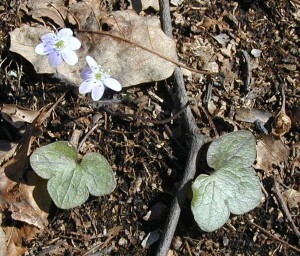 In 2010 hepatica is just about done blooming in the first week of April. 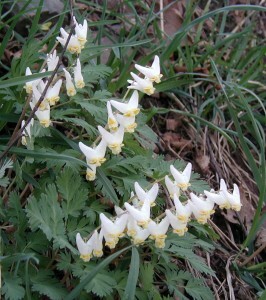 Many other plants are also flowering earlier this year. 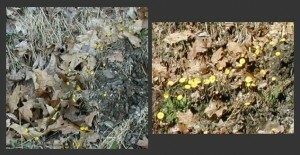 All the plants photographed in the wildeherb links above are blooming now or just past blooming. 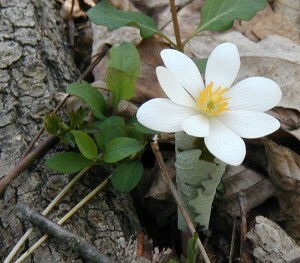 For instance, the star magnolia has leaves developed already and maybe two blossoms are still hanging on one limb. All the other flower petals have fallen to the ground. 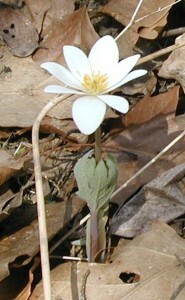 Yet, in 2006 the same star magnolia tree was in full bloom on April 11 and no leaves had yet developed. 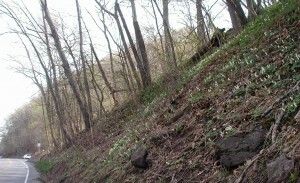 Tulips, peach trees, ferns, dandelions, and violets all seem to be at about the same development stage now (April 9, 2010) as shown in the April 19, 2006 photos. The one exception is cinquefoil. 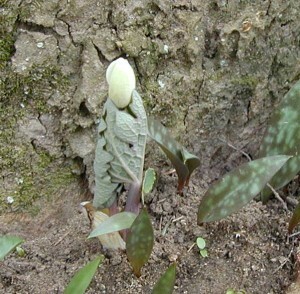 Its flowers have yet to appear, so perhaps their blooming is dictated more by the available sunlight instead of the prevailing temperatures. 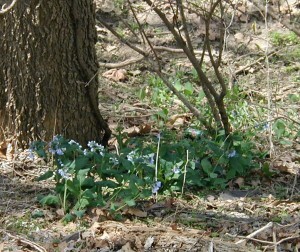 A photoperiod-sensitive plant, perhaps. 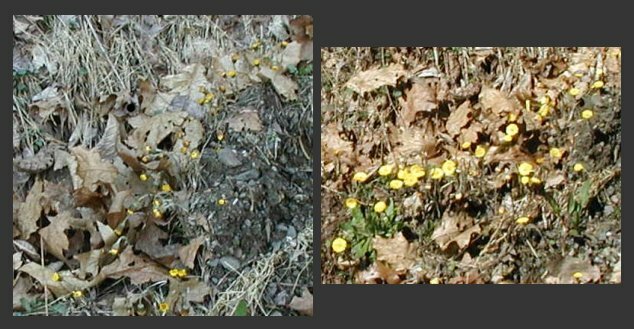 If the old weather data could be matched up to the images, we might actually be able to document temperature-dependent blooming times. It would be interesting to find out which of the Spring ephemerals are more keyed to temperature than sunlight. 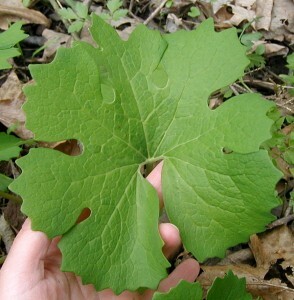 That might make it possible to go into the woods at the right times to spy on them! 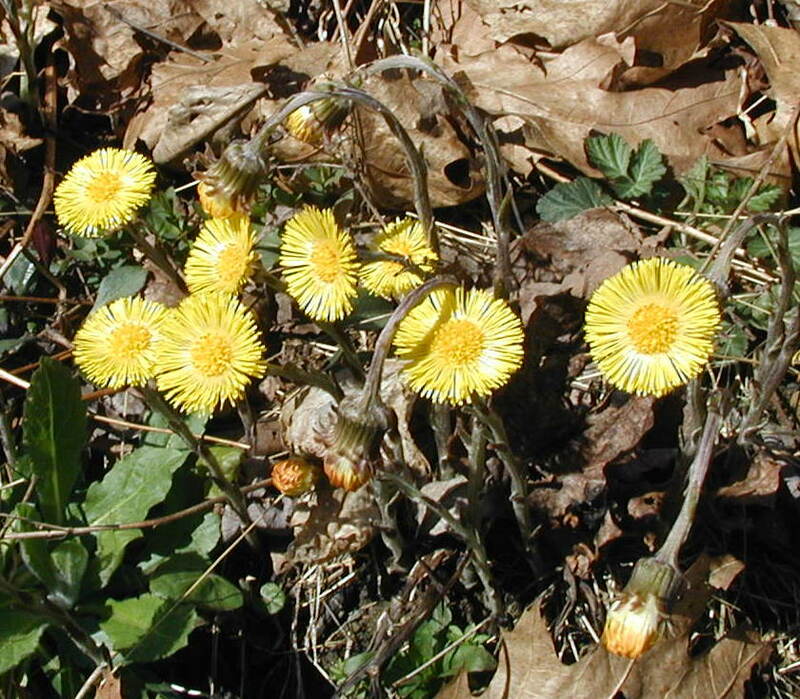 On a grander scale there are implications here regarding global warming. 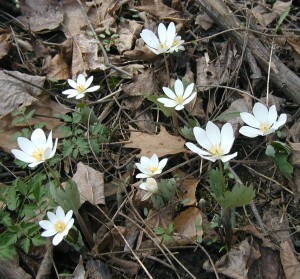 It’s been documented that blooming has been occurring earlier in the year in some places and for years now. Some are worried that the insects and other pollinators for the early blooming plants might not be in the proper areas to perform their pollinating service at the right time. 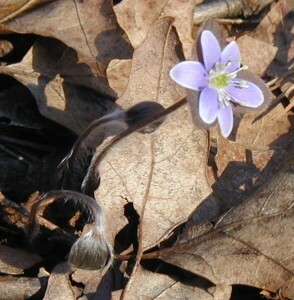 Insects slumber, birds and bats migrate. 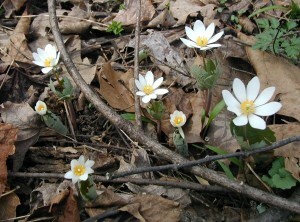 During early spring if the plants get way ahead of the pollinators, it could spell disaster for future generations of plants. 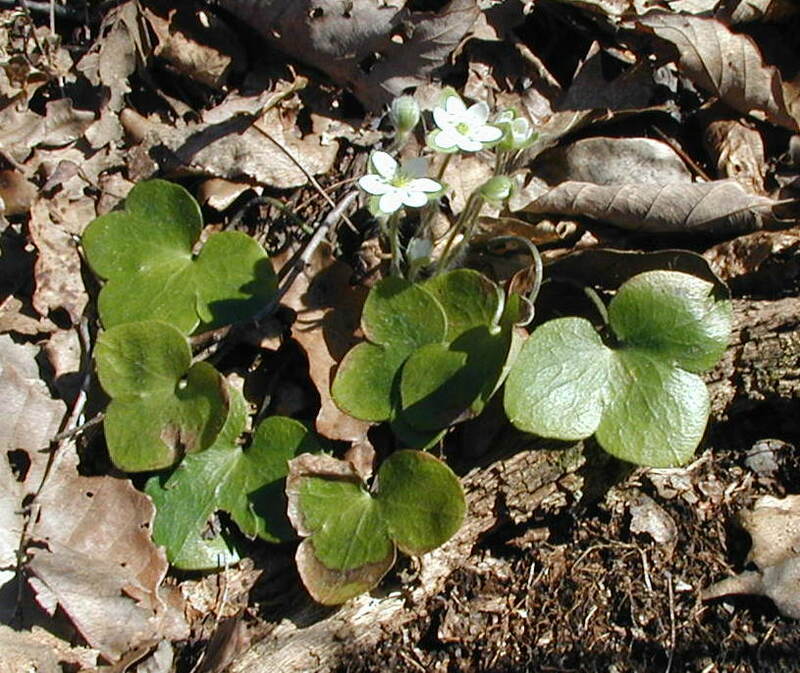 At the extreme this raises the question of possible plant extinction due to climate change. 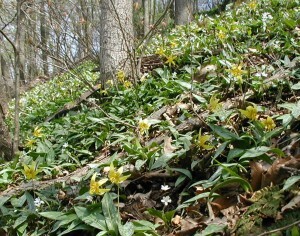 Without pollinators in the scenario, these flowering plants won’t be able to reproduce by seed. To lend credence to these observations, it’s already been documented that plant life-cycles can be disrupted by a changing climate. 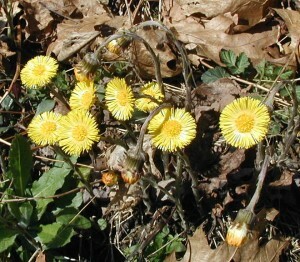 Coltsfoot is still blooming in places along roadsides in Pennsylvania. 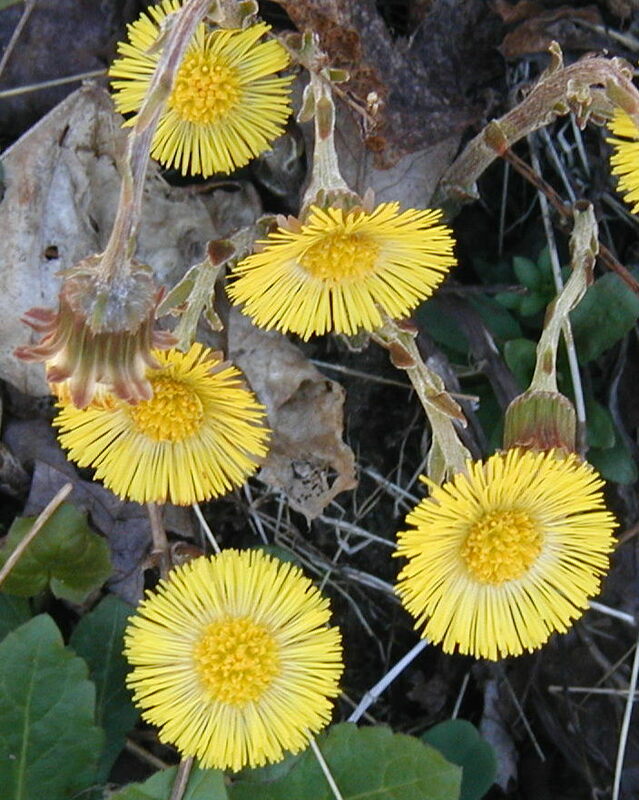 Coltsfoot, Tussilago farfara, could be considered a Spring Ephemeral flower, but that term is usually reserved for woodland flowers that have a very short life cycle with a narrow window to bloom. 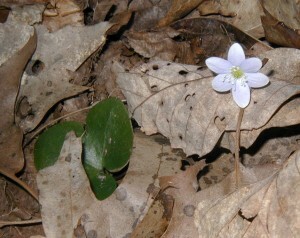 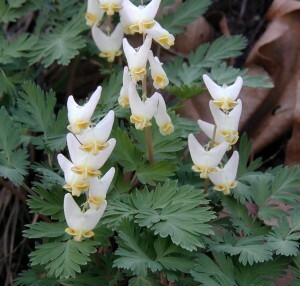 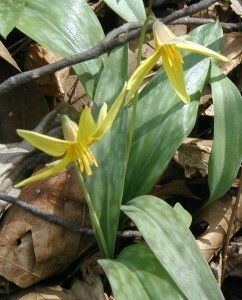 The Spring Ephemerals only receive enough sunlight to bloom after it gets warm enough in late winter and early spring up until the time when the trees develop their leaves. Once the forest canopy is filled in not enough light gets to the forest floor for these small herbaceous plants to continue flowering. 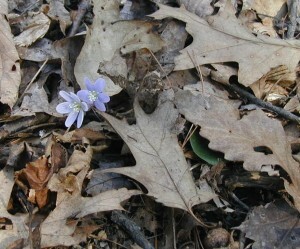 Note that some of the flower heads are stilled bowed down from the night. 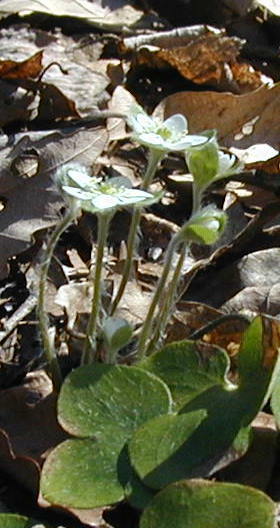 These flower heads will also rise up once they receive enough sun. 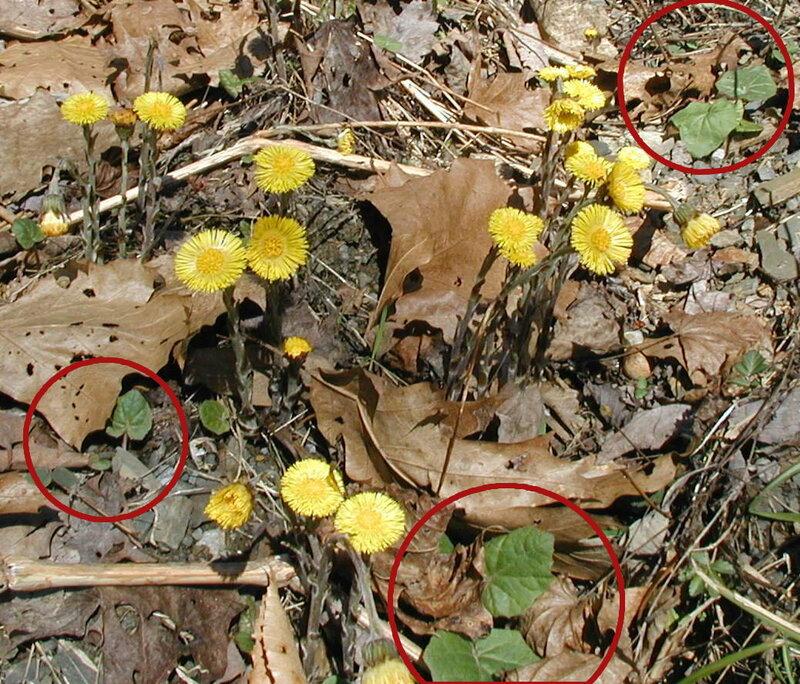 The left photo shows coltsfoot flowers closed in the late afternoon and the right photo shows the same blossoms opening up in the morning sunshine. 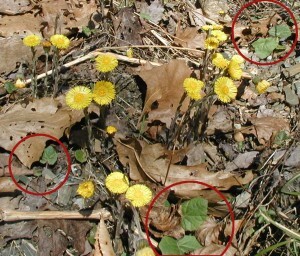 Coltsfoot leaves growing by April 1. 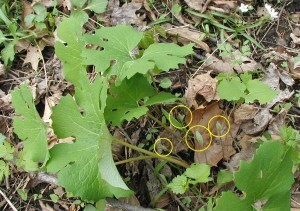 Note the red-circled areas that highlight the hoof-shaped leaves. Coltsfoot flower heads open and closed. 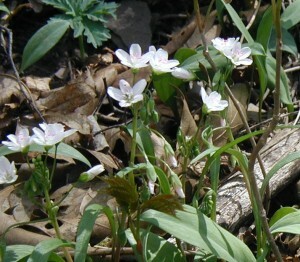 Note the very narrow ray flowers, maroon cast to scales on flower stems, and bowed heads of closed blossoms.